The “core” of this boil can be seen clearly. Boils are nasty looking, painful, sores that are recognisable as red lumps on the skin, (usually puss filled) that cause a heck of a lot of discomfort for something that is so small. In this article we are going to look at how to treat a boil effectively. Boils are usually (but not always) caused by a bacterial infection of a hair follicle. In the medical world, the bacteria responsible is known as Staphylococcus Aureus or “Staph” for short. In it’s “simplest” form, Staph is fairly easy to kill and can be dealt with effectively by both antibiotics and various natural treatments. However, over use of antibiotics over the years has led to new strains of Staph emerging. These strains are able to resist antibiotics and as such, are hard, if not impossible to treat using antibiotics. These resistant strains are referred to as Methicillin Resistant Staphylococcus Aureus or MRSA. How long do boils last? This all depends but usually a boils will last no more than 14 to 21 days if left to its own devices. This timeframe can vary greatly and so this is just a rough guide. So…how should you treat boils? Antibiotics are one option for dealing with boils…but they may not be the best option. It depends on whether your boil was caused by regular Staph or one of the MRSA stains. This is because different approaches are required. As MRSA is not limited to boils, I will be explaining how to deal with boils caused by “regular” Staph. 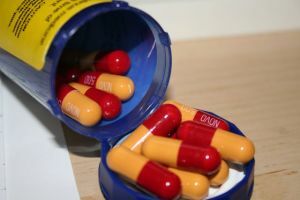 Because “regular” Staph is sensitive to antibiotics, you can take a course of antibiotics prescribed by a doctor or you can use natural treatments. If your boil is particularly nasty, the doctor may choose to lance it in addition to prescribing you antibiotics. So…should I use antibiotics or a natural treatment? 1) Antibiotics lower your immunity which increases the risk of re-infection. If the course of antibiotics is to short or you stop taking it to soon, there is a high chance that the Staph will “evolve” and become resistant to those antibiotics. Then, if you choose to continue with an antibiotic approach, you will need stronger antibiotics, once again increasing the likelihood of reinfection. In my opinion, if your immune system couldn’t keep “regular” staph at bay, then chances are your immune system is weak and needs support, not to be further weakened by antibiotic use. Also, chances are you will have to use some natural treatments anyway to deal with the boil topically (i.e. externally/on the skin). 2) Natural treatments are very effective against Staph. In fact, they are even effective against MRSA! This is because they have a complex molecular structure (unlike synthetic/manmade antibiotics) which the bacteria can not develop a resistance to. What next…how do I treat boils topically? 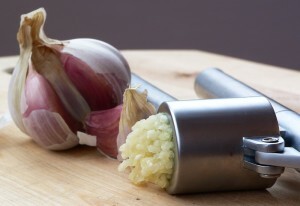 The Allicin found in Garlic is proven to be effective at killing Staphylococcus Aureus, the bacteria that causes boils. Whether you choose to use antibiotics or natural treatments you will probably want to treat the boil topically. For this I recommend that you use a combination of essential oils and hot towel compresses on the wound site. With regards to the which oils you should use, certain essential oils such as Tea Tree, Lemongrass, and Oregano are very good. Other natural treatments such as, garlic, Olive Leaf Extract, and Manuka honey are also highly effective staph treatments. Try to keep the wound site/boil clean, dry and covered with a dressing. All you can really do now is let the boil run it course, and using the techniques I have mentioned to reduce the effects. Can I get more specific treatment advice? You sure can. If you need more in depth information on how to deal with boils or MRSA feel free to check out my eBook called funnily enough) The Boil Bible. In The Boil Bible, I go into a lot more detail and provide more information about treatment methods, the essential oils and other effective products. I also share my personal story and treatment regime/routine. I hope this article has helped you to understand how to treat a boil effectively? The boil bible!!! This is completely awesome! My sister has several boils and we were just searching up ways to treat them. So glad that we stumbled upon this site and am excited to try these methods out! Who would have known that Makuna honey can be used to treat staph? I love it! Kyle, thanks for your positive comments. I hope your sister makes a speedy recovery. Great article, and very informative, I like natural remedies too! Is there a way to purchase a hard copy of The Boil Bible? Unfortunately The Boil Bible is only available in electronic form at this time i.e. PDF (for computers and ereaders), ePub (for ereaders), and mobi (for Amazon Kindle). Please let me know if I can help you with any other questions you may have.